Fiat 500 – Yes, of course! – Marketing, of course! Meat Fiat 500 with its new "Yes, of course" jingle, what else? Pretty like this blog's domain name. Smart, isn't it? WHATEVER IT IS YOU'RE AFTER, THERE'S A FIAT SOO FOR EVERYONE. (4.3), and Combined 58.9 (4.8). CO2 emissions 113 g/km. Terms & Conditions apply. Retail customers only. Not available in conjunction with any other offer. 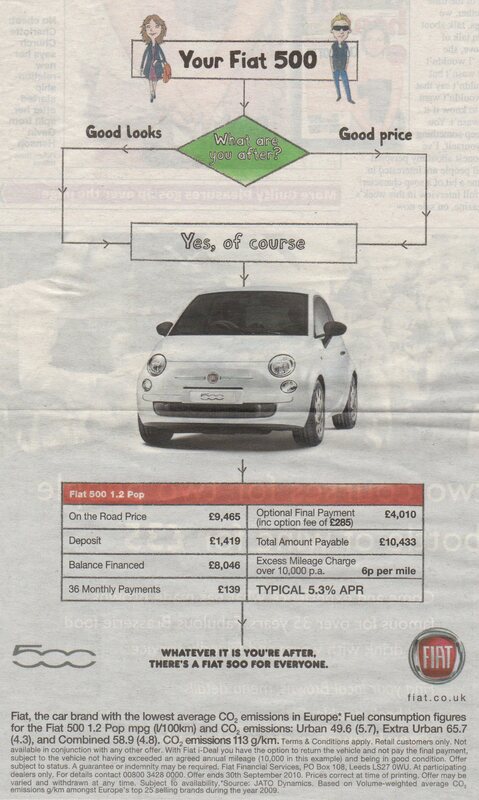 With Fiat i-Deal you have the option to return the vehicle and not pay the final payment, subject to the vehicle not having exceeded an agreed annual mileage (10,000 in this example) and being in good condition. Offer subject to status. A guarantee or indemnity may be required. Fiat Financial Services, PO Box 108, Leeds LS27 OWU. At participating dealers only. For details contact 00800 3428 0000. Offer ends 30th September 2010. Prices correct at time of printing. Offer may be varied and withdrawn at any time. Subject to availability. "Source: JATO Dynamics. Based on Volume-weighted average CO2 emissions g/km amongst Europe's top 25 selling brands during the year 2009. Posted in Articles. Tagged with Fiat.